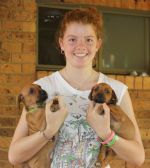 Hannah is one of Nkosi and Saran's babies that was chosen out of a litter of ten puppies to stay with us. She is a girl that shows alot of her fathers' gentle characterisics. Hannah and Saran have retained a very close relationship and where one is, the other is not far away. Hannah loves the family life and our days and weekends away at dog shows plus meeting new people and other four legged animals. Me at 6 weeks old. Cute Eh! Honest, it wasn't me. Anyway, I am only a puppy !